As Jim Dennison from the Simon Community outlined the extent of the poverty and homelessness in Belfast, the younger players were clearly taken aback. Jim had joined the street sleepers at Cornmarket in the city to thank the group. I asked him to talk about the scale of the problem. The Simon Community has 110 beds in their city hostels. They are supposed to be emergency beds. Twenty five years ago, this is what they were. So, in the mid-1990s, the average length of tenancy of a room in the Simon was ten days. Today, the average tenancy is 13 months. It is no longer emergency accommodation. It is a place for people to live. Twenty five years ago, houses and flats were affordable for everyone. This is because the unwritten social contract in those days was that a house was a place for human beings to live. But towards the end of the '90s, homes became a commodity to be traded like any other. Suddenly, the places where human beings were sheltered, where we cooked, and made love, and reared youngsters, and grew old, became known as The Property Market. With lightning speed, homes became dehumanised. Now, they were items to be traded, like stocks and shares, or gold, or bitcoin. Hedge funds and investors began buying up vast swathes of houses to add to their portfolios. The people who lived in houses, giddy with excitement, sold them at a profit and moved somewhere cheaper. The intrinsic worth of a house, its social purpose, were irrelevant. The only question was: How much can I get for it? As prices sky-rocketed, the newspapers gushed over the gold rush, producing glossy Property Market supplements. These don't usually feature photographs of the homeless littering the streets. When I went to Trinity College in 1987, I visited the Caffreys on Iona Road with my parents. Mae is the mother of John Caffrey, the Dublin footballer from the 1983 All-Ireland champions, and Paul, the Dublin manager before Pat Gilroy. She urged my folks to buy the house next door. It was a fine, five-bedroom red-brick terrace. It was on the market for IR£25,000. My parents balked at the price and decided to pass. A few years ago, I saw the same house in The Irish Times property supplement. It was on the market for offers over €895,000. As house prices became perverse, houses soon became unaffordable for large numbers of our citizens. With fewer and fewer people owning more and more of the houses, people were forced to rent. As the problem worsened, rents quickly became more or less unaffordable. In the North, the government initiative that allowed Housing Executive tenants to buy their home was the final chapter in this grotesque tale. The tenants bought them cheap, then sold them on, on the basis of the illusion that they had made a great profit. Then they bought somewhere else slightly cheaper, only to find they had lost their home and society. Overnight, the Northern Ireland government washed its hands of its responsibility to provide homes for those in need. Public housing disappeared. It is the same story in the south, where successive governments sat back and let the market dictate. I had a case last week involving a couple and their two young children. They have a total income of £242 per week. Their rent is £600 per month. They are living in poverty. They are visiting food banks. The parents are eating as little as possible to make sure the children, aged six and three, do not go without. They are exhausted and demoralised. I sat quietly outside Court 1 as this young mother wept. It is a national disaster. Jim Dennison told us last Saturday in Cornmarket that there are 80,000-100,000 homeless people in the North alone. I could see Chrissy McKaigue shaking his head in disbelief. 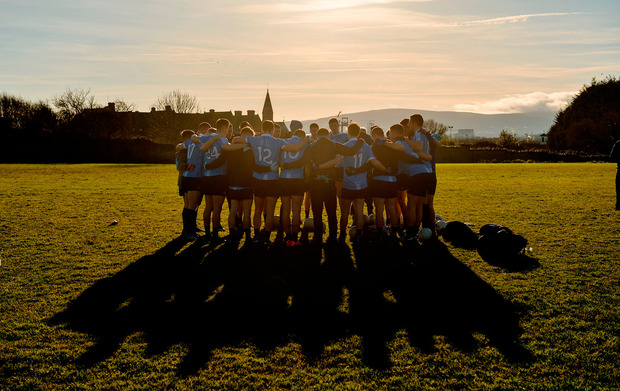 Throughout one freezing Saturday night and Sunday morning, a group of GAA volunteers got a glimpse of an invisible world. John came over to say hello at around 4.0 in the morning. He was licking his lips repeatedly. "Heroin?" I said. "Aye, I'm so dry. I've none left now so I'll be very sick tomorrow." He told us a very funny story about his ex-wife. A lot of homelessness begins with the break-up of a relationship. One person has to leave the home and suddenly they are on the street. Unless you can escape it quickly, the street swallows you up. But escaping is very difficult. The despair and misery can be temporarily banished with a heroin injection or a handful of diazepam tablets. Or a half-bottle of vodka. Assaults are a constant danger. I spoke to one man in the doorway of Marks & Spencer whose face was badly cut. I asked him if he ever shopped in M&S. He laughed. As I was kneeling beside him chatting, the police came over and asked him if he could describe his assailant. One of the police officers got on the radio to the city centre CCTV team to see if anyone could be identified. "They're being attacked all the time, often by passers-by," he told me, "there's very little we can do." We sat with 'M', a 20-year-old kid who was taken from the family home by Social Services because of parental violence. After a series of care homes, he managed to get a job and a flat. When he was laid off six weeks ago, he lost the flat. His sleeping bag was soaked. Dermot Dowling, the St Brigid's chairman, gave him a heavy thermal coat from the provisions van, and a bowl of warm stew. He told us he had been attacked in a hostel the previous week and felt safer on the street. Conor McConville from the Lámh Dhearg club commented about five in the morning that the length of the days would get him. He is right. The night, without sleep or warmth, lasted an eternity, even though we were in a big, jolly group and knew we'd be going home in the morning. The GAA is wasting its power. We have huge financial, social and political clout. We do not wield any of it. We own the politicians, particularly in the south, where the majority of them can only be elected if their GAA constituents back them. Yet we have no coherent strategy. We do not even have a lobbyist in the Dáil. Look at our capacity: the actuaries, accountants, surgeons, stock brokers, architects, engineers, tycoons, lawyers etc. None of it has been harnessed. The social side of the GAA has been entirely neglected by the hierarchy, and we must accept some blame for the dysfunction in our society. At around 6.0am last Sunday, 'M' stood up and announced he was going to McDonalds for some breakfast and to warm up. As he said goodbye and walked off, I found myself trotting after him. "Kiddo, wait up. Come and live with me for a while, until we can get you settled." "You sure?" he said. "Yes." After he had slept soundly then eaten like a horse, he put up Christmas decorations with my kids, threading baubles and weaving lights around the hedges, his face shining. He left the house on Friday morning for a job interview, wearing one of my suits. He is 5ft 6in. The suit drowned him, but he was proud as punch. On Friday evening he arrived back in triumph, with his new, freshly pressed work uniform. He'll find out from day to day whether he is working, by accessing the company website with a password. A government spokesperson will explain that a zero-hour job contract gets you on the employment ladder. Maybe he could explain how this destitute young adult can get on the property ladder.